Youth For Christ began in 1958 in the Westman region, and over time has evolved and matured in its mandate to address the needs of the whole person. YFC is a community organization dedicated to serving young people. 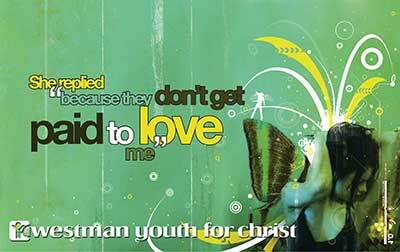 YFC addresses social needs, teen issues, physical needs, employment needs, health and well-being, and spiritual needs. YFC assists teens and families move through difficult life situations, assists teens as they mature and develop, and upholds or creates the home environment as needed. Westman Youth For Christ has adopted the vision of "creating a community of Hope, where no young person goes hungry; spiritually, emotionally, physically or relationally". Youth for Christ is a Christian organization and seeks to assist people to know God and receive all that God intends for each individual. We are not a church and do not require people to believe a certain way to be involved. YFC is open to all young people. YFC does not discriminate involvement in our programs based on religion, race, sexual orientation or in any other way. YFC staff and the organization operate according to Biblical principles. YFC services are available to all young people. Teenagers naturally seek friendship, support and fun. Happily, we are able to offer the encouragement, direction and counseling that comes from authentic and real youth opportunities. We are committed to long-term relational support with young people because we believe that life is a journey that we need to walk through together. It is through offering friendships AND services that young people will find hope. We seek and support those who model honesty, enthusiasm, respect, forgiveness and a love for God. The involvement and support of volunteers is essential to the effectiveness of socially and economically responsible programs. The family, a young person's primary social network, has the potential to be the most influential context in which learning and value formation can occur. Our support of the caring role in this process is imperative. Where, or what, are the young people turning to for help? Not everything that happens in life is easy or fair, and too often we as people turn to dangerous coping mechanisms. We need to support each other and stand up for each other. The rise in youth violence, substance use, and family troubles necessitate strong help. Our programs and staff advocate positions and actions which further the common good of children, families and the communities we live and work in. YFC Westman is affiliated with YFC Canada, but we are a separate and individual charity, fully responsible for our own programming, staffing and funding. YFC in Canada is structured as an association of chapter ministries each receiving their "charter" from the National Office of YFC Canada in Surrey, BC. Each of the 24 chapters has an independent board of directors and has achieved charitable status through the offices of CRA in Ottawa. Each chapter is led by an Executive Director who is recruited and employed by the local Chapter Board. Chapter ministries are commissioned to serve the youth of their area through locally approved programs which conform to the international standards and philosophy of YFC International. YFC Chapters are encouraged to broaden their area work through the development of satellite operations in communities within their sphere of influence. There are currently 51 satellites in Canada under chapter leadership. The National Office of YFC Canada exists to serve the local Chapters through the development of a national vision and strategic plan as well as the provision of common services. The National Director is responsible to a National Board of Directors and gives leadership to the movement through the Executive Directors at the Chapter level.